Once you get to know Kristin Bauer, it’s hard to imagine she portrays a vicious, vampire bar-owning, human child-hating, and blood sucking termagant in True Blood. I can’t even imagine her doing odd things that some celebrities are caught doing: like pouncing on talk-show hosts’ couches, selling baby photos to tabloids or doing ‘ridamndiculous’ poses for the paparazzi. Oh no, that is simply not Kristin nor will it ever be. This stunning and statuesque Racine native from Wisconsin is not only a talented actress; she’s a concerned animal activist, a blushing new bride and an extremely gifted artist. I had the great fortune and pleasure of meeting Kristin at her Art show at Anthony’s Framing & Gallery in San Marino CA last September 26. Dressed in a lovely floral printed mini-dress, I found her inside the gallery giving her avid guests a tour of her exquisite work. I also started walking around and saw that she is quite adept in capturing the pure essence of her subjects. 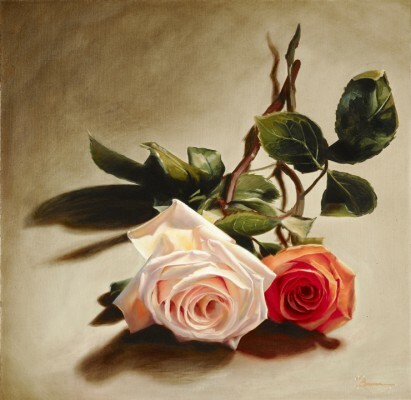 Her paintings somehow find a way to ensnare your attention by finding deeper meaning in simple yet beautiful objects. She is somewhat of a symbolic realist. To me her magnum opus is her “Mother and Child” painting it’s a clear depiction of love and undeniable tenderness between parent and offspring. She even shares with me that it reminds her of Sting’s thought provoking song about the Cold War, “…Russians love their children too”. 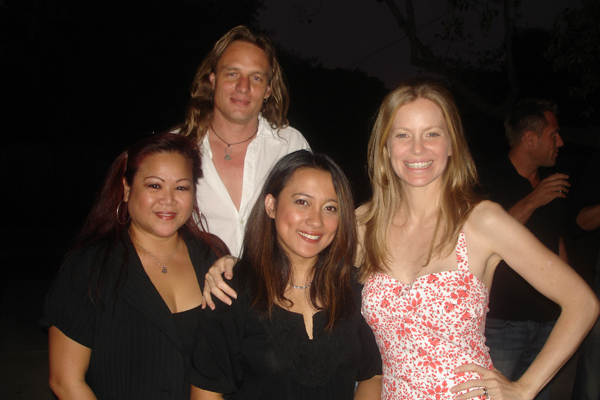 As with all my encounters with the True Blood actors, I found myself with looming worries and nervousness but that quickly subsided when I sat down with Kristin and the love of her life, Abri Van Straten (lead singer and guitarist for the band, “The Lemmings”. His solo recording is set to be released later this year as well as the band’s next cd). On her website Kristin tells the story of how she met Abri. She discovered his music by sitting accidentally on his CD in her nutritionist’s waiting room. She bought the CD on Itunes and fell in love with his voice. After several emails to Abri’s manager she managed to set up a date, a second date followed a few days later and they haven’t been apart since. Kristin jokes how she hunted down a man, chained him to her radiator until the Stockholm effect started kicking in. Did you end up chaining him to your radiator? AVS: [chuckles and gives Kristin a tight squeeze] “It was hard for me the first month…” [Kristin laughs]. When did your passion for painting start? Where do you do your work? Do you own a studio? Where do you get your inspiration for you art? Do you have a favorite model you like to paint? Do you have particular medium you favor and did you ever think about venturing into sculpting? Have you been to South Africa with him? I know you had your wedding at your hometown and so I’m wondering if you plan on doing the same thing when you go back to South Africa with him. You know, get married everywhere. Thank you so much Kristin for sharing your time with me and I look forward to seeing you in True Blood and I can’t wait to see more of your art pieces in the future. And to show our love for our favorite vampire shrew, I brought with me a gift, courtesy of The Vault and the Stephen Moyer Webring. She was tickled pink to see her custom made t-shirt and showed it off to Abri and her friends. 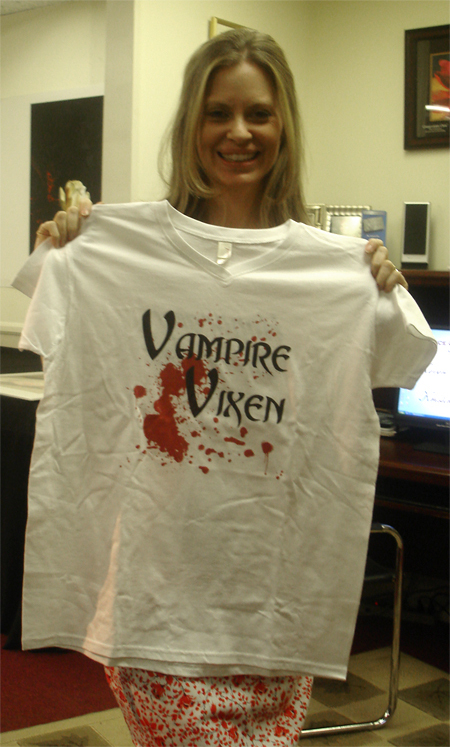 The Vampire Vixen t-shirt was made specially for Kristin, but it is now available in the Billsbabe’s Shoppe. I remember her telling one of her colleagues, “Can you believe I’m already married?” and her friend just replied, “What I CAN believe is why he married YOU”. Hell yeah that’s true. She is the perfect package and she’s right, there is no reason why you can’t fall in love with her. Kristin Bauer also works on commission, check out her website for more info. What a great interview! Gretchen/BBB does it again. We love you too, Kristen. Gretchen you’ve done it again! GF you are getting very good at this. Kristin appears and sounds to be such a grounded, wonderful person. Her work is just stunning…..so lifelike. I’m always amazed when I see people with this kind of talent. To view the world with such beauty must be amazing. Great interview. Well done, Gretchen. Terrific interview. Kristin is a talented and gifted artist. I love her as Pam, and am delighted to discover this other side to her. Her work is exquisite. And last but by no means least, she and Abri make a lovely couple. This is a wonderful interview. BBB you are awesome. Pam and Abri make a striking couple. She has some beautiful artwork. Not only is she a wonderful actor but a talented painter as well. Thank you for letting us get to know Kristin. It was a pleasure. Loved this interview with Kristin ( isn’t she gorgeous? ) She seems so easy going and open. She apparently has a great sense of humour as well! I have seen some of her artwork and it is fantastic! I would like to own a piece myself and will. 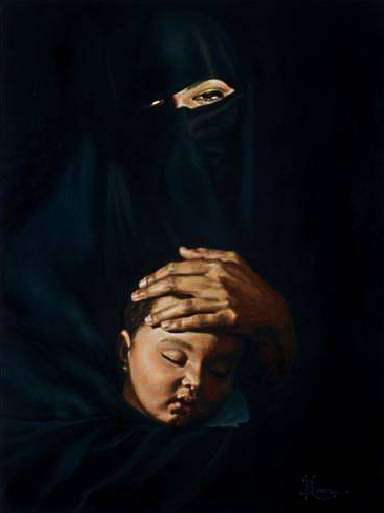 The “Mother and Child” piece is lovely – she really captured it’s beauty. I loved to hear how she and Abri met – it like a fairytale! Seems like love at first sight – how could he not, she is simply gorgeous inside and out. I wish them 100 years of happiness. Great Interview BBB and thank you for going! Your description of the event and happenings made me seem like I was actually there. Thank You for bringing this interview to us so that we may peek into the outer-lives of the Cast of True Blood. I hope we see more of “PAM” in Season 3 – she is such a hoot! And hopefully we will see more of her backstory and love interest. Wonderful interview Gretchen! You’re really gettin’ good at this! Kristin sounds like such an interesting person to talk with and I think she’d make a great carousing buddy too. Her art work is just amazing. Let’s see here: she’s gorgeous, has a fantastic figure, wonderful sense of humor, she’s a newlywed, she’s an extremely talented artist and she gets to be on True Blood, as one of the most popular characters on that show. How lucky can one gal be????? I’m so proud of you Gretchen! You did us Billsbabes proud. Gretchen- nobody does an interview like you do! Wonderful (I like how you threw in a little Viggo mention too, you’re a hoot!)! When I first looked at ‘In a Perfect World,’ I thought it was simply a photo, but then found it was a painting- wow. Kristin is obviously a very talented artist in her acting and in her artwork. Thank you for interviewing her BBB, and thank you Kristin, for allowing her to interview you. Loved it! Saw that too, Gretchen. How nice that you able to meet her in the gallery. Interview her and view her artwork. So once again, a member of the cast is wonderful and talented….True Blood is chocked full of that sort! You are certainly are doing a good job being The Vault’s woman on the beat. Loved the interview! Another great interview BBB. Kristin is so talented. I too thought the roses were a photograph at first. Much happiness to her and Abri. We saw so little of Pam in S2. Hope there is much more in S3. BBB many interviewers could take a lesson from you. Great job and you look amazing as always. Kristen is delightful and we adore her and Pam. I hope see more of Pam in S3. We did not get near enough of her in last season. It’s hard to believe she has only been painting for 10 years. I’m very particular about what I hang on my walls and I’d love to own one of her pieces. I wish Kristen and Abri a lifetime of happiness. Thanks Gretchen. Kristin’s work is so amazing. Wonderful! Love a woman who goes that extra mile to get her man. Wonderful interview Gretchen! Thanks for posting it Shad. Wonderful interview BBB! :-) Well Done! Kristen is such a doll and so amazingly talented. Her love story is such a sweet one! What a great interview, BBB! Kristen is a ridiculously talented woman. I love Pam! Kristin really is such a warm-hearted and talented actress. Thanks for giving us yet another chance to get to know more about her. Kristin definitely is a multi-faceted artist. She sure is a female version of Viggo! What an insightful interview. Well done again BBB..
Beautiful job all around–Kristen seems so nice and down to earth. And so multi-talented. Thanks for the illuminating interview, Gretchen. Thank you again Gretchen for another great interview. It seems that Kristen has it all-great looks, nice personality, talented actress and artist, and a great looking husband! Thank you Kristin for sharing your work with us. Hope we see more of Pam in season three. I love her role in True Blood and her artwork is fantastic. Kristen Bauer is radiant! Her art work is beyond beautiful. She is multi-talented and married to an amazing man. Abri van Straten with the band “The Lemmings” seems to be just as down to earth and “real” as what Kristen is. I actually sent them an e-mail saying congratulations on the wedding and I got an e-mail back from Abri thanking me….. now how cool is that. BTW, The Lemmings music is great…. take a listen! As soon as I get my credit card working again I am going to buy Abri’s CD on Itunes, I love that music. Well, call my a liar! I just went into Amazon.com and cannot find “Imperceptible Shift in the Light” which is the CD I downloaded. Has 11 songs on the album. WalMart has it on-line for .94 each song. But I could swear I bought it from Amazon.com (because they allow you to download the entire CD/Album for less) and I think it was $6.00 or $7.00 for all 11 songs. I want to buy it, I am not going to cheat a hard working musician out of a few dollars. When I get my new credit card I will get it online in one place or the other. absolutely love Kristen Bauer!!! Love her art too!!! Plus yay for marrying a South African!!!! Very proud!!! :D Hope you are both are extremely happy!!! !